A HUGE shoutout to my dear sweet friend who introduced me to this Christmas Quiche with Sausage and Cranberry. I’ve always thought that a quiche is an adult food that is hard and difficult to make, and I’ve always enjoyed eating them whenever given the chance. I’ve learned that the name quiche just sounds fancy and really, this is a piece of cake or pie in this place to make. Although the name implies it’s just for Christmas, the Christmas Quiche will soon be something I make for Sunday mornings or evening dinners when I just don’t have time to spend a lot of time in the kitchen. 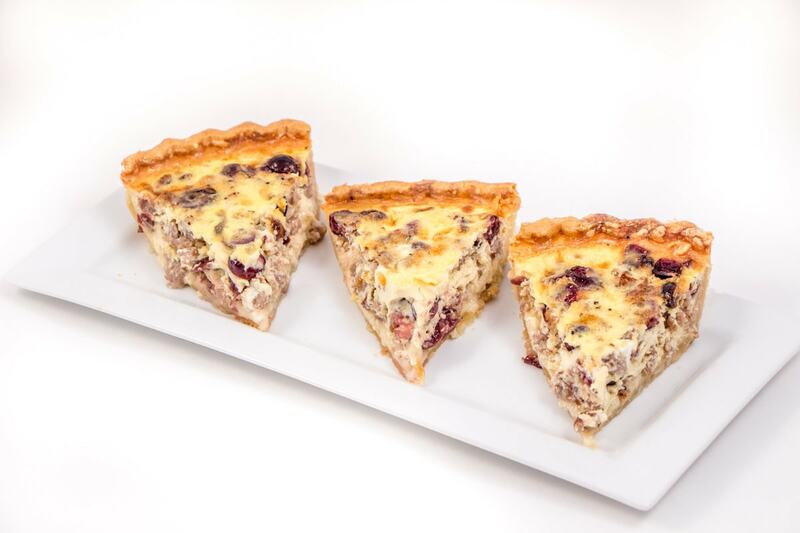 The ingredients for the Christmas Quiche – Sausage and Cranberry are very simple. 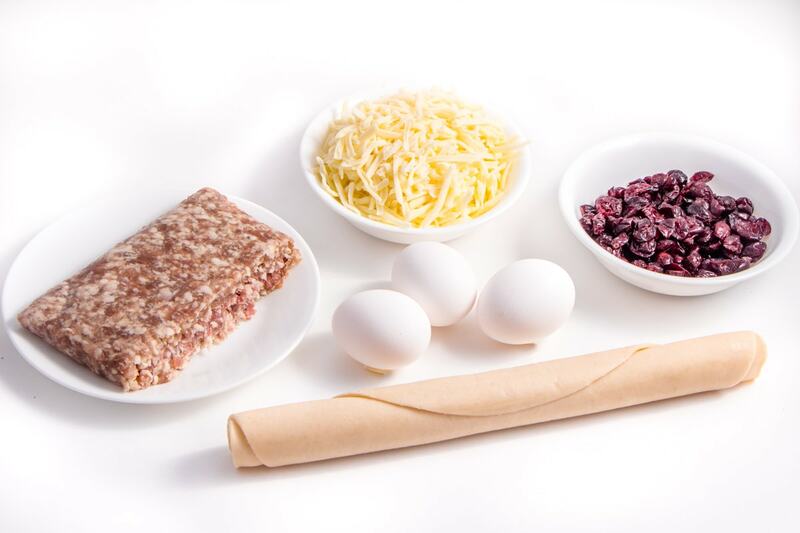 Sausage, Cheese, Egg, Pie Crust, Milk and Half and Half. It’s pretty simple to throw together. Brown your sausage and drain off the grease. Mix your cranberries into the sausage and set aside. In a mixing bowl, mix eggs, milk, half and half, and salt and pepper. Wisk it together and set it aside. 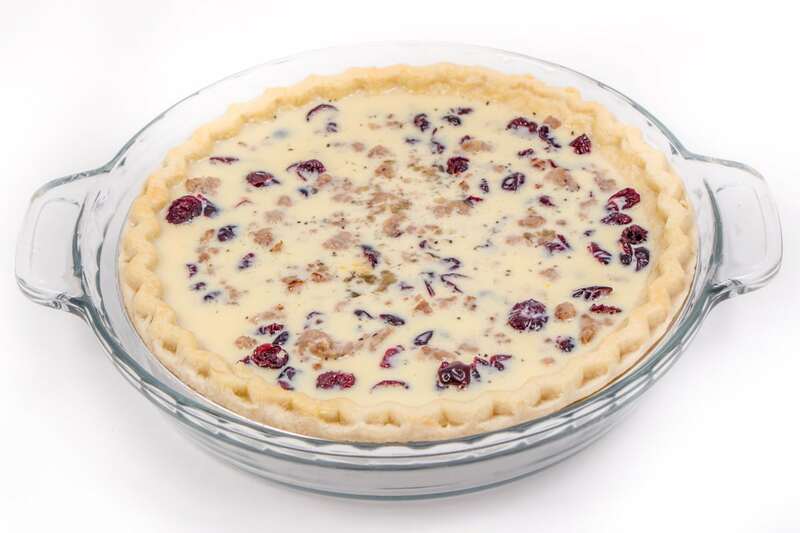 Bake your frozen or refrigerated pie crust and let it cool. In your baked pie crust, place your cheese on the bottom. Why? Do you ask? Well, in a quiche with all the milk and egg, the cheese will float to the top, by placing it on the bottom with all your heavy ingredients on top, it will stay and not float. Simple little trick but in the end it does not matter the order. It all will taste the same. Place your sausage and cranberry on top of the cheese and then pour your milk mixture on top of everything. Pretty simple, right? Well it really is just that simple. Bake at 375 for 45 minutes or until a knife in the center comes out clean. 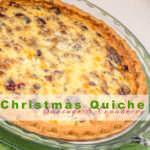 Allow the Christmas Quiche to cool before cutting. It will serve in nice pie shape wedges. My family has given this Christmas Quiche – Sausage and Cranberry a Two Thumbs Up which means, we will be making it again and again. Loved this Quiche and it reminds me how easy they are to make. More Great Recipes to Try! 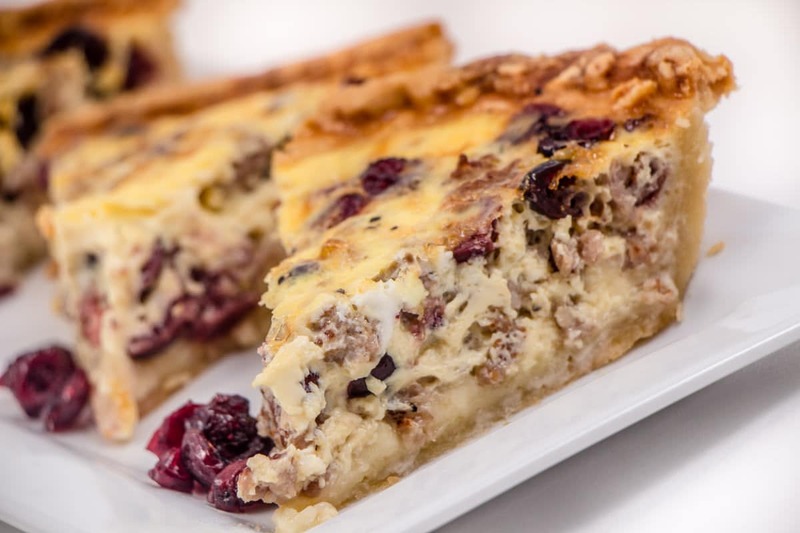 A Breakfast Christmas Quiche that is a little bit sweet with the cranberries mixed with a lot of flavor. Bake at 375F for 45 minutes or until knife inserted into center comes out clean. In a mixing bow, mix milk, half and half, eggs, and salt and pepper. Wisk to combine. In cooled pie crust place cheese on the bottom, and layer with sausage and cranberries. Pour milk and egg mixture on top and bake for 45 minutes. Remove from over and allow to cool. It will set as it cools. Serve warm or cold. Enjoy a beautiful breakfast. I made this quiche several weeks ago and I have my second one in the oven as I write this! Had never made a quiche before this and I especially love the ingredients (sausage and cranberries.) Thanks for a lovely, easy and delicious recipe. I love hearing this! 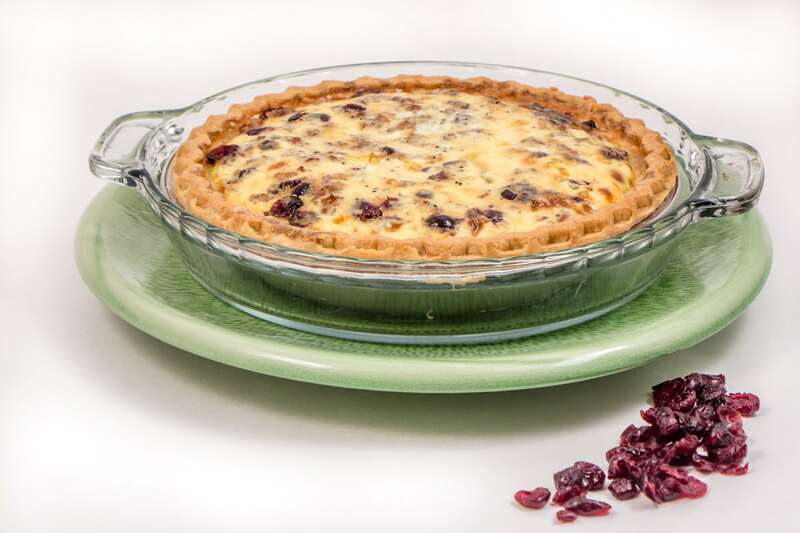 I found this quiche to be the perfect balance of flavors and I love the hint of sweet from the cranberries too. So glad you are enjoying this simple recipe. Oh, that sounds so good! I love quiche! Yum! I’ll put this on my list to try. I need to make this. I have a HUGE bag of craisins and other than oatmeal cookies i don’t know what else to make. i love quiche. the sweet and salty sounds so good. If you love the sweet and salty, this is definitely it! It is delicious. Just be cautious adding in extra salt, it really don’t need it. We love to add pepper though! Wow this looks amazing! Definitely will need to make this during the holidays. Thanks for sharing! Looks so good, I will have to try this! Looks delicious! A must try! I love quiche! This looks so delicious! I will definitely need to try this! Cranberries and cheese now that is a new combination that I would like to try. Will try this recipe. Looks scrumptious! I think this needs to be pinned to my Christmas board for sure!!! I love quiche, but thinking about it now, I don’t think I have ever actually made it. I hope you try this one and make it. It’s super simple! Yum!! I want to make this. Great photos. Well first, what an incredible presentation!! The appearance of the food is mouthwatering and I can almost taste it through the screen! The layout was impressive and easy to follow, beautifully pictured!! Good job! Thanks for sharing, looks like a good Christmas tradition to add! Thank you so much Charlie! I work hard on my layouts so it’s easy to find and not full of so much of a story. It’s a wonderful Christmas Tradition for sure, but this recipe can be enjoyed all year round too! I honestly never think to make quiche and this looks fantastic! I pinned it so I will try to remember to make it sometime. It’s super quick and easy to make. Make sure you do try it! It’s worth it.